This system allows a user to keep five substrates under vacuum while transporting and interfacing to a multitude of vacuum systems. The substrates are loaded one at a time from a loadlock into a cassette. 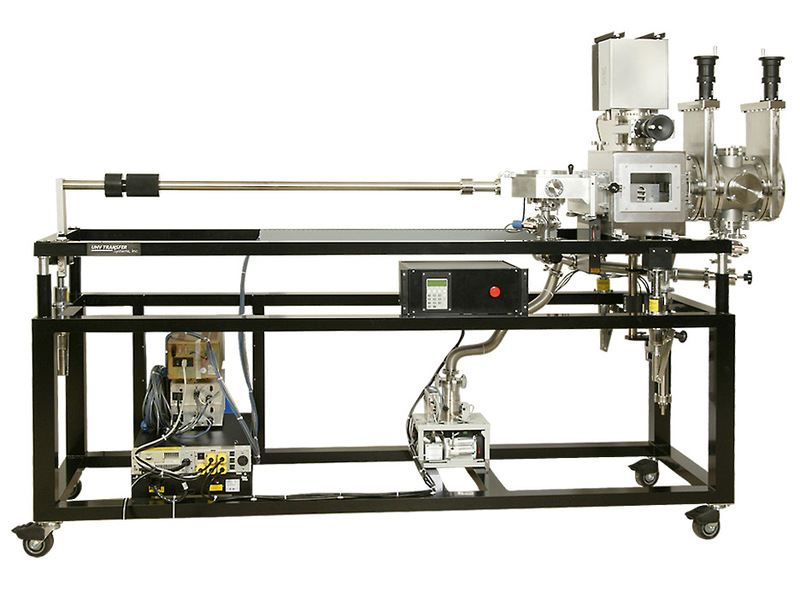 Once loaded, the motorized elevator positions the cassette to allow a manual transfer arm to pick up any one of the substrates and deliver it into whichever process or analysis chamber the system is attached. Two magnet carriages on the manual transporter provide dual-action so the substrate holder can be edge gripped for delivery and/or then “flipped” over for access to both sides of the substrates. One dry pumping station pumps the loadlock and/or the "interstitial region" which acts as the gateway between the cassette chamber and the process module. The cassette chamber is pumped by an ion pump. The entire vacuum system resides on a frame with adjustable height features. All the electronics are run through a UPS that can power the system independent from a power source for hours.